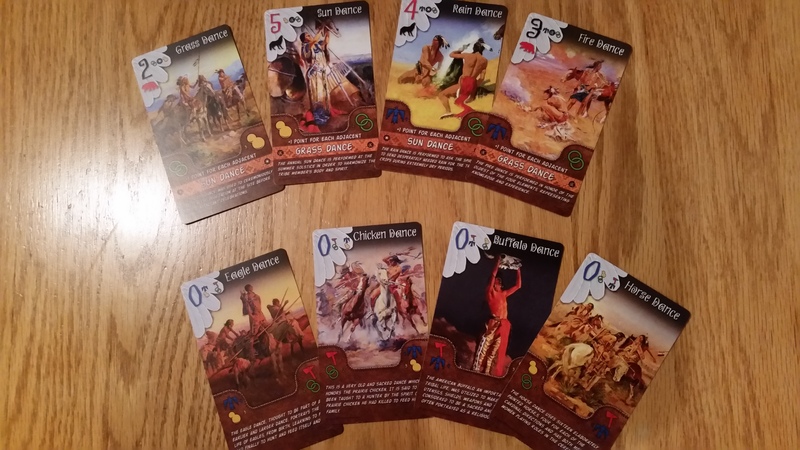 Created by veteran game designer Scott Hansen, Mahola is beautiful card game themed around the dances of Native American culture. Designed for 3-4 players the goal is to create the highest scoring dance each round. The first player to win three rounds wins the game! 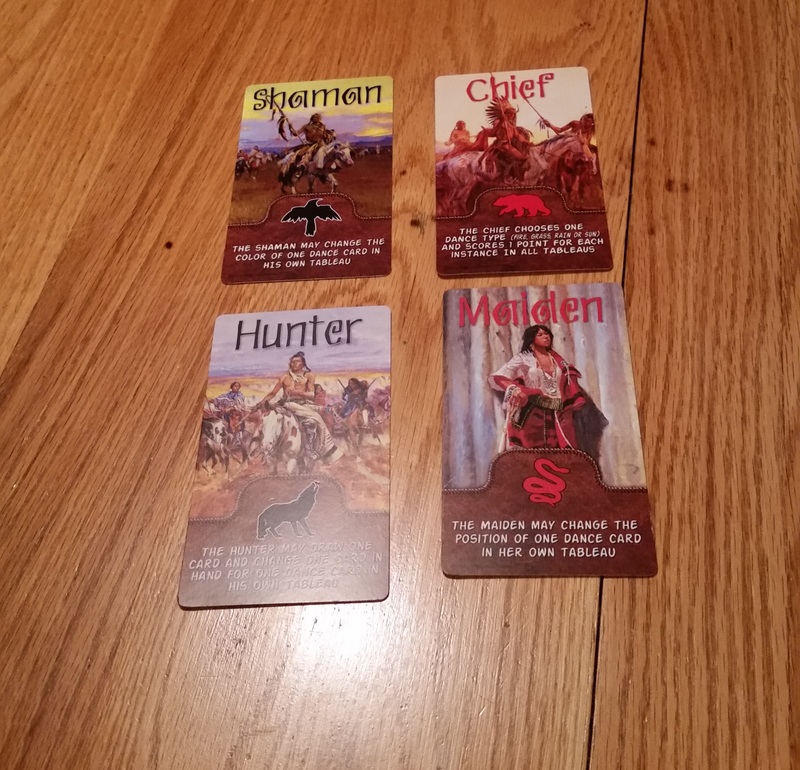 There are four character cards provided. Shuffle them and deal out one to each player face down. Each character has a different ability that will affect your cards before scoring. Shuffle the dance cards and deal out five cards to each player face down. This is your starting hand. Place the remaining cards in the center of the table to form the draw deck. There are 4 standard dance cards, Rain, Sun, Fire and Grass totaling 40 cards. 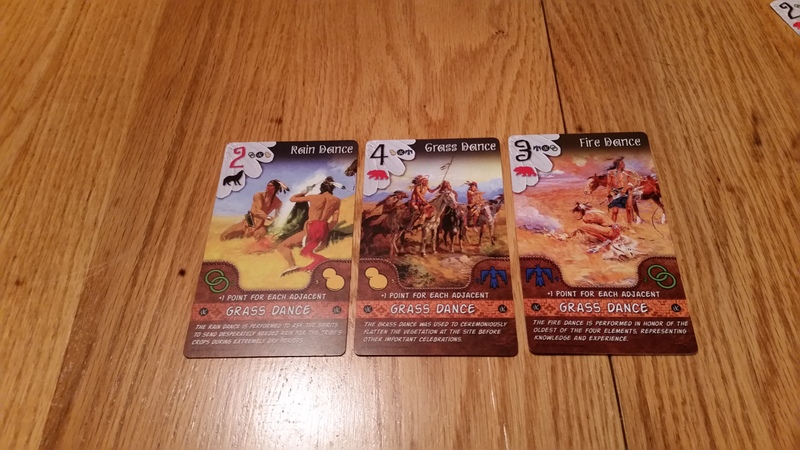 There are also 4 special dance cards Horse, Chicken, Buffalo and Eagle totaling 4 cards. The area in front of you will form your dance tableau. Choose one card and play it face down to your tableau. Once everyone has played a card, all players should reveal their cards together. All new cards must be played on either end of your tableau. You may not play a card between two cards that have already been played. After revealing cards, each player will pass one card to the player on their left and one card to the player on their right. Then draw one new card from the draw deck. After the fifth turn player reveal their characters and adjust their tableau according to their characters ability. The player with the highest score wins the round and gains a favor token, in this case a real piece of wampum. Each card has a colored number in the upper left corner. If the color matches your character then add those points, if it doesn’t match then subtract those points. If the color doesn’t match but the spirit animal matches then score nothing. Add the value of any matched secondary dances and any points for adjacent dances. Even though I have two left feet, I can dance with this great game from S.P. Hansen Games. The oversized cards are beautiful and pack in a lot of information. Sometimes larger cards can be a tough sell but these are definitely worth it. The game is easily portable and plays in about a half an hour, which is right in the sweet spot for me time-wise. Mahola is simple to learn, fun to play and has a nice tactical element to it. It would be a welcome addition to any game library. We’ll post the link when the kickstarter drops and tell Scott Legends of Tabletop sent you!